Digital music’s rapid growth on the market is of unprecedented nature. While other technological advancements may be considered as “evolutionary”, digital music’s course is “revolutionary”. Supported by an extensive knowledge of previous “analogical” music, musicians and engineers were able to conceive a new and remarkable media of creating and delivering music which is now shaking the discography market to its roots. Managers involved in the discography industry predict that “analogical” music will soon disappear and leave its place to digital music. Eventually, no more analogical recordings will take place, and all artists will upload their music online, to be downloaded by users for a cost. 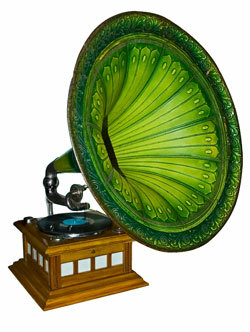 A old gramophone used to play vinyl records. However, the ear will not resent tremendously much of the shift from analogical to digital, although we are used to listening to “analogical” music. The word “analogical” refers to the methodology used for recording the music. Just as any other sound, music is physically constituted of air pressure waves. These waves can be recorded by producing a mechanical groove, supposing that its size is proportional to the air’s pressure. This is the case of the vinyl record. For instance, if we modify the intensity of magnetization of a magnetic tape instead of a mechanical groove, we can use such a tape to record the music. As a matter of fact, the size of groove and the intensity of magnetization are the exact representation of the air pressure’s variation we meant to record. If we reproduce the groove or the magnetization as air pressure, we obtain the same sound that generated them. These are the defining characteristics of “analogical” music. Nevertheless, the analogical method of reproduction had some serious flaws. The vinyl record and the magnetic tape had a limited lifetime; after a few hundreds reproduction they became unusable, apart from the fact that they degraded while in storage. Furthermore, they produced a noticeable background “white” noise, and had a limited “dynamics” – a measure of the maximum difference of sound intensity they were capable to store. As music technology progressed, a different recording methodology arose, “digital” recording. This new recording system stores the music as a series of binary numbers. The human ear is capable of hearing sounds reaching up to 20 kHz. If we “sample” the music twice this value, the ear will not be able to distinguish any gap in the recording. As matter of fact, the audio standard for CD calls for 44,100 sample per second of the music. Therefore the recording contains 44,100 binary numbers per second of music. The magnitude of this number can range from zero to 216, were 16 represents the number of bits - used in the single music sample. As a consequence, a Compact Disk, with an exceptional capacity of 700 Megabytes, can only contain one hour of music. Newly created digital music had a significant turn when German mathematician, Mr. Frauhnofer, had a brilliant idea. Based on the fact that the music does not change suddenly between one sample and another, he recorded only one sample and computed the subsequent one until the changes were so radical that computation was no longer possible. As matter of fact, he replaced the memory requirement with a computing requirement. On average, it was now necessary to record a sample (also known as “frame” in this particular method) every twelve. In essence, it meant that our compact discs could now contain twelve hours of music. In addition, now music could also be easily transmitted over the Internet. Mr. Frauhnofer had just invented the Mp3 (Motion Picture Expert Group, Layer 3), often referred as lossy compression, or psychoacoustic compression, since uses a peculiarity of the tandem ear – brain to store and reproduce the music. 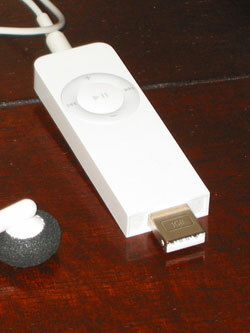 A modern Mp3 player (iPod) able to store around 20 hours of digital music. Free from costly storage media, this initiated the era of “Digital Music”. While analogical music was intrinsically bond to the media containing it (the vinyl disc or the magnetic tape), digital music can be stored in a countless number of supports, can be streamed, and can be processed with computers for editing and stored into Mp3 players as small as a pen (see iPod and similar products). Furthermore, music can be composed digitally. Virtually any sound can be sampled and reproduced as a musical note. By recording one instrument at the time, the result is the possibility for a single person to create a fully fledged orchestra. Digital music is ubiquitous. The digital channels of distributions are accessible to anyone at very low cost, whereas analogical channels were expensive in every phase: from recording, to storage and editing. Digital music is everywhere, constantly expanding through today’s means. Nearly anyone can produce and distribute music at no cost. Digital music has drastically changed the listeners’ experience, and has brought a drastic revolution in the life of music composers. Nowadays there is no need for a music composer to write out the music notes by hand, and have a musician playing for every instrument on his music score, whereas it was necessary when utilising analogical music. Computer software programmed specifically for carrying out this task is available for the creation of digital music. In the musical composition field this is called “Computer Notation”. The music sheet can be created directly on the computer display. 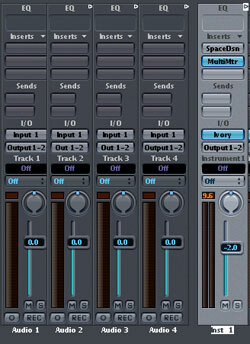 Furthermore, the necessary nuances can be added through “sequencer software” and the MIDI protocol. In such a way, music can be created with no actual instrumental necessity. A standard MIDI keyboard (“MIDI Controller”) can record the notes played and transmit them to the computer through the standard MIDI protocol (Musical Instrument Digital Interface) and, with specific software, create a final MIDI file playable by any standard computer software audio player such as Windows Media Player, Quicktime and many others. The file can then be edited and played with sampled instruments. A MIDI keyboard used to input notes into sequencing or notational programs. A MIDI file contains, in binary format, the information about the music score (or the instructions regarding it), and MIDI messages such as “Note on” which represents the exact time the note has to start play, “Note off” when has to end play, or “Velocity” that represents how loud the note has to play compared to the other notes. General volume is controlled by the “Channel volume” messages, and other control messages are used to describe the instrument to use, the stereo panning, and the “after touch” (amount of pressure on the key). A standard MIDI file contains up to 16 tracks, one for each instrument. Usually the melody is on track n. 4 and the drums are on n. 16. Tracks can be recorded separately, and any sampled sound can be assigned to each of the 128 instruments in the sound library (for standard audio modules or audio cards). The sounds in the standard library are of vast variety. They differ from keyboards, to strings, percussion, brass, woodwinds, plucked strings, vocals and even to bird singing, ocean waves, gunshots, telephones, and dog barking. MIDI files are defined as “parametric” files, since they do not contain actually any real recorded audio, but only the parameters necessary to execute the subject music. The final quality of the sound, and its type, will depend from the synthesizer, which transforms MIDI messages into real music. Before digital music reached its turning point determining its extraordinary growth and popularity, sequencers and the synthesisers were represented by expensive hardware. Nowadays, every function can be performed on a standard PC. Compared to Digital audio files like wav or mp3, MIDI files are much smaller in size, and can be played on any MIDI enabled platform – from the most expensive Yamaha Sound Canvas Module to the simplest cell phone. However, the listening experience will differ in a certain way. Sequencing software such as “Logic”, “Cubase” and other similar, is used to produce the music score, by entering the notes singly with the mouse or the MIDI Keyboard (controller). More notation specialized software such as Finale or Sibelius allow the creation of professional sheet music for digital and press production. Modern sequencers allow to create virtual audio mixing consoles for pure digital editing. Another category of software worth mentioning is the “Arrangers”. By inserting a basic melody an Arranger can compute on its own, by using rules of harmony and counterpoint, the requested accompaniment. For instance, the program “Band in a Box” executes such arrangements. However, these programs do not arrange professional accompaniments, and the discrepancy between the computerised accompaniment and a manual one is still significant. Digital music encompasses altogether the exceptional quality of live music, the technology of advanced software, the possibility of creating music at virtually no cost, the chance of automatically creating music scores from simple melodies, easy transfer over the net, reduced sizes with high bit rate, and above all, digitalising music means sharing with the whole globe a pleasure that has been necessarily considered as individual over the past centuries. With digital music, the revolutionary future musicians were seeking is now. The contents, views and opinions in this article are those of its author. Discuss this Article on the Forums!